The UUCUV Meetinghouse is home to our worship services, offices, and our primary meeting space. Our home at 320 Route 5 South in Norwich, Vermont. 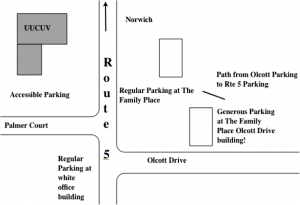 It is diagonally south of Fogg’s Hardware, and directly across from The Family Place. From Dartmouth, cross the Ledyard Bridge, left at the third light onto Route 5 South;1 mile south on Route 5 – grey sanctuary and white farmhouse. From the rest of NH, take Route 89 to 91 toward exit 13. From Route 91, take exit 13; left under the underpass; left at the first light; 1 mile south on Route 5 – grey sanctuary and white farmhouse. The Farmhouse is a nineteenth century Greek Revival style farmhouse which houses the Administrative office, Minister’s office, Library, and Religious Education Classrooms. The fully-accessible Sanctuary is full of natural light and boasts top-class acoustics for both music and spoken word. This beautiful worship space seats up to 120 people.